The majority of homeowners tend to think of awnings as a summertime accessory. And they would not be entirely wrong in thinking so- awnings provide shade and energy-saving comfort to your home in the hotter months of the year. You may even have already stored away your canvas awning for the season so that it is ready to set up again in spring. But an aluminum awning is another matter altogether: rather than having to store it (and pay for the storage) to keep it safe from ice and snow, this type of awning will actually keep you and your home protected from winter weather! Read on to find out what the benefits of an aluminum awning are, and why getting one for the winter season is a good investment for you to make. One of the main benefits of an aluminum awning is that it is sturdy and durable. As such, it will not buckle under the weight of accumulated snowfall, and in fact, it will keep your porch and doorway clear of snow by covering them. This means that even during the heaviest storms of the season, you will never be snowed in. Aluminum awnings cut down on snow removal time by covering up your porch and carport; with only the driveway to shovel, think of the energy and hassle you will be saved! With an aluminum awning keeping the area underneath of it dry, you will not have to worry about ice forming and posing a risk as you walk in and out of your home as well. 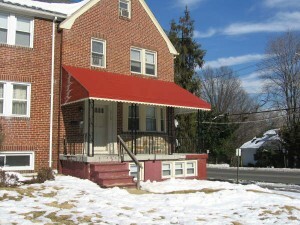 An aluminum awning can help improve your safety this winter by guarding against snow and ice! Call today for more information or to get started on your awning installation project.